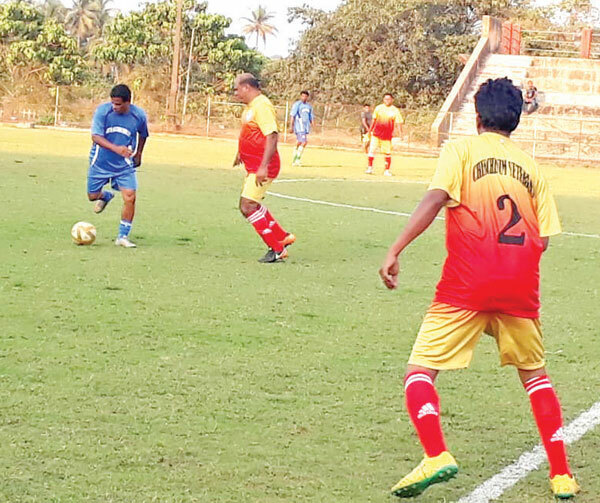 RAIA: Chinchinim Veterans got the better of Nuvem Veterans 6-5 via the tie-breaker and moved into the quarter-finals of the Rachol Veterans Cup organised by Rachol Veterans, at Raia village panchayat ground, on Wednesday. Nuvem netted two quick goals through Remedious Fernandes and Marcus Carvalho in the 15th and 32nd minutes respectively, but the joy was short-lived as Chinchinim levelled terms through Jerry Fernandes and Marcelino Pinto in the 23rd and 50th minutes respectively. In the resultant tie-breaker, Agustinho Cardozo, Inacio Cardozo, George Dias, Mahesh Lotlikar and Rosario Dias scored for Chinchinim while Remy Colaco, Agnelo Colaco and Wilson Fernandes netted for Nuvem Veterans.